Supercharge your Health with MD Ultimate Green! Much of today’s food is depleted of natural nutrients due to the method of farming and processing. Many studies confirm that diets lacking in proper nutrients lead to illness. On the other hand, diets that are rich in essential nutrients have been proven to go a long way in maintaining excellent health. Take depression and alcoholism for example: these conditions can be treated effectively with high doses of Niacin (vitamin B). Here’s another fact: if you are a label reader and strive to meet or exceed the minimum recommended daily percentage of food values (vitamins, minerals, etc), then you need to know that these values are based on a 2,000 calorie per day diet. What if you cannot eat 2,000 calories per day without gaining weight? What if you are on a diet? If you are one of the millions who struggle to get all the nutrients you need from food alone, then you should consider MD Ultimate Green capsules. 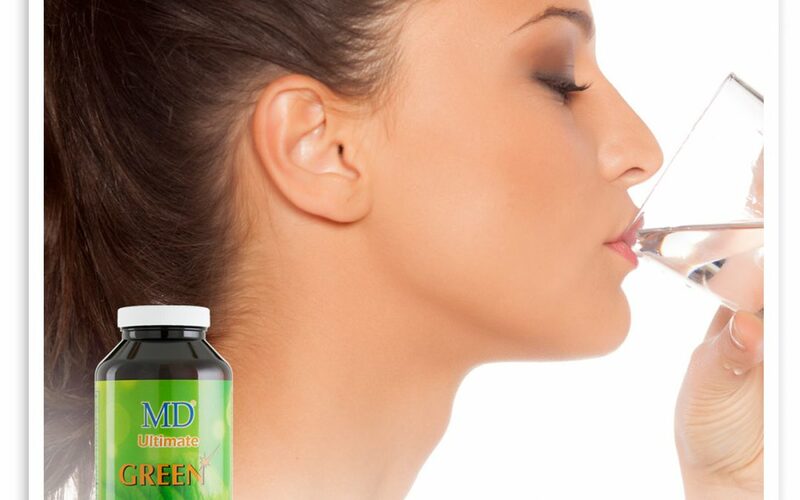 MD Ultimate Green capsules are a superfood consisting of 16 natural nutrients. They are an alternative to multi vitamins, loaded with enzymes from a rich array of organically grown terrestrial plants that are skillfully blended with aquatic plant forms to provide extra health benefits. These superfood nutrients fuel the body and provide an extraordinary beauty benefit: they help your skin, hair and nails look healthier, glowing and younger … within 30 days! Spirulina: This is the world’s richest source of non-animal protein. The spirulina used in MD Ultimate Green is grown aquatically in Hawaii. This dark green micro algae contains approximately 60% to 65% protein which is 85% to 95% digestible. Chlorella: Often referred to as “The Emerald Food”, chlorella is noted for (and gets its name from) its high content of chlorophyll. This dark green micro algae that boasts many of the same qualities as Spirulina. De-oiled Soya Lecithin: This is an important nutrient that assists in the assimilation of all fat soluble vitamins, including vitamins A, E, D & K.
Barley Grass Juice Powder, Wheat Grass Juice Powder and Kamut Grass Juice Powder: Incredibly rich in vitamins, minerals, protein, enzymes and, of course, chlorophyll (which gives all of these nutrient rich grasses their dark green color). Rice Kernel Membrane Powder: This is the outer coating and most nutritional part of rice (valuable nutrients are destroyed by modern processing), providing a great source of B vitamins, bran and vitamin E.
Icelandic Kelp, Nova Scotia Dulse (Sea Vegetables): These are rich in natural minerals from ocean water; and an excellent natural source of iodine. High Pectin Apple Fibre: Apples are first pressed, eliminating the juice, then dried slowly to yield a high pectin content. Some studies show that pectin helps bind harmful excessive cholesterol and triglycerides. Wheat Sprouts, Superoxide Dismutase (SOD) and Catalase: Sprouts are a rich source of many vitamins and minerals, plus important growth factors required by the plant in its earliest days. Coenzyme Q10: This is essential for maintaining heart health, found throughout all cells of the body with a special concentration in the cells of the heart. Royal Jelly: This is one of the world’s richest natural sources of panothenic acid (vitamin B5), sometimes referred to as the anti-stress vitamin. Jerusalem Artichoke Powder: This is a phenomenal food source probiotic and an excellent source of natural potassium. Lactobacillus Acidophilus and Bifidus Bacterium: These probiotic organisms, known as “friendly flora”, assist the body in digestion, assimilation and elimination. Consume up to 5 capsules of Ultimate Green each day. Be sure to consume a minimum of 8 oz. liquid (purified water or your favorite juice) each time you take Ultimate Green capsules. Ultimate Green is suitable for adults, teenagers, children and even pets.